Check out what our artist Mauricio Benega created at Farmlands Mossburn. Taihape now has its own take on one of Andy Warhol’s most famous artworks, becoming the eighth rural town to benefit from Farmlands’ HeART of the Community. The colourful Pop art mural painted by renowned artist Otis Frizzell on Taihape’s Farmlands store features portraits of six sheep pulling typical sheep faces. Inspired by Andy Warhol’s famous 1962 Pop artwork of Marilyn Monroe, the mural was co-created with the help of Farmlands Taihape staff to reflect the town’s spirit, history and environment. The work paints another picture of Taihape, known as the gumboot capital of New Zealand. A gumboot was not included in the mural’s design because the Farmlands store sits less than a kilometre away from the famous corrugated iron gumboot sculpture. More than 50 excited locals went to the mural’s public gifting ceremony in early November. Farmlands Taihape Business Manager Mike Collings says they were stoked to work with an artist of Otis’ calibre to create something for the community. “Locals are already saying how fun and quirky the mural is. It complements our gumboot capital status quite nicely and it will bring the community a lot of joy in years to come.” - Michael Collings, Farmlands Taihape Business Manager. In November last year Farmlands Kaikoura received a HeART of the Community piece of art, the seventh of 15 pieces of art commissioned for Farmlands stores around New Zealand. The mural took shape as the Kaikoura community marked the first anniversary of the magnitude 7.8 earthquake that struck the area on 14th November 2016. Created with collective inspiration from numerous members of the Kaikoura community – including students and teachers at the high school, the council, Lions Club, Iwi, local tourism providers and the Farmlands Kaikoura team – the artwork celebrates Kaikoura’s recovery, strength and resilience. The team at Farmlands Kaikoura wanted the mural to showcase their “slice of heaven”, and the connection between the people and the landscape that is at the heart of the Kaikoura community. The artwork references what locals feel makes the area special, from the sun-grazed mountains, to the endangered Hutton’s shearwater seabird, the sparkling paua and of course the crayfish. An idea from a local high school student inspired the hands on each side of the mural, which represent the strength, courage and spirit that has been highlighted in the community during a challenging time. Kaikoura District Council Mayor, Winston Gray says he is grateful to have Farmlands commission an incredible artist to promote the community in Kaikoura. Mr G says he was honoured to have the opportunity to bring attention to such a hard-working community in the process of restoring their town since the earthquake. Farmlands Kaikoura was the final HeART of the Community mural for 2017, wrapping up an eventful year. Taumarunui recently became the sixth Farmlands store to receive a HeART of the Community piece of art. The huge mural depicts one of the many river steamers that frequented the Whanganui and Ongarue rivers during the early 1900s. The river steamers were used for transporting people, livestock and supplies to the surrounding districts. The design for each HeART of the Community artwork is created with help from the community and Farmlands staff – and for Taumarunui it was the Whanganui River that had special significance. This significance shines through in the mural. The 290 kilometre Whanganui River is the second longest river in the North Island, after the Waikato. The river has spectacular scenery in its middle reaches, north of Pipiriki, where it passes through a series of narrow gorges set amidst lush native forest. The Whanganui River made headlines recently when it was announced that former minister Dame Tariana Turia and educator Turama Hawira will act as the “human faces” of the river to ensure its rights are protected. This followed the world-first decision made earlier this year, which granted the Whanganui River its own legal identity, giving it the same rights as a person. Mr G recently visited the town of Dannevirke to complete the fifth HeART of the Community art project. Although this mural is the smallest of they’ve painted so far, it tells an important story of Dannevirke’s farming history. Named for the Danish and Norwegian families that settled there in 1872, the town of Dannevirke thrived well into the 20th century on the back of farming prosperity. The Dannevirke mural depicts a team of Hereford bullocks, which were commonly used to transport goods in the area during the early 1900s. The week was action packed with plenty of people stopping to chat to Mr G and his wife Milly as the artwork took shape – around 200 people turned up to the official unveiling to see the finished product. Mr G says he loves the opportunity to feel the heart and vibe of each community that he paints the murals for. Dannevirke Mayor Tracy Collis was delighted her town had the chance to be a part of the project and to bring the focus back on the people who contribute so much to the community. Gisborne welcomes Farmlands’ HeART of the Community project and Mr G.
Farmlands Gisborne was given more than just a splash of colour recently, as Mr G worked his magic on the fourth HeART of the Community piece of art. The inspiration for the artwork came from staff at Farmlands Gisborne, who are immensely proud of their community and what makes it special. The mural includes the Tolaga Bay wharf, Rere Falls and an amazing portrait of Te Moana-Nui-a-Kiwa Ngarimu, the first M ori recipient of a Victoria Cross. Te Moana-Nui-a-Kiwa, affectionately known as Mo, was born at his family farm at Whareponga in 1918. He attended Whareponga and Hiruharama School, before finishing with 2 years at Te Aute in Hawke’s Bay. Mo returned to work on the Whareponga farm for 4 years and also played rugby union for the Hikurangi team and participated in the Hikurangi Parish Choir. At age 21, he went to fight in World War II as a member of the 28th Maori Battalion. He was killed in 1943 while valiantly defending a position they had captured from German forces in Tunisia. He received the Victoria Cross posthumously in 1943. Mo’s legacy continues in the form of a scholarship to promote Maori education – and even though he is buried at Sfax in Tunisia, his memory lives on in the community. Farmlands is proud to be able to keep the memory of this important past alive for future generations and highlight the unique identities of New Zealand’s rural communities as part of the HeART of the Community project. Farmlands Putaruru is now the third Farmlands store to receive a locally-inspired art piece. The Farmlands Heart of the Community project is making its way around the country to showcase the unique identities of New Zealand’s rural communities. The team at Farmlands Putaruru wanted the mural to pay tribute to the town’s sawmilling history, the beautiful Waihou River (also known as Blue Spring) and of course the ruru (morepork), New Zealand’s only surviving native owl, from which the town’s name is derived. With Paeroa and Invercargill already complete, Mr G says he was excited to capture the spirit of Putaruru in his artwork. “It has been so enlightening to visit smaller cities and towns where people really wear their hearts on their sleeve,” he says. South Waikato District Council Mayor, Jenny Shattock says it has been both refreshing and inspiring to see a prominent artist promoting the great town of Putaruru. “The Putaruru community are some of the most passionate and loyal people,” she says. 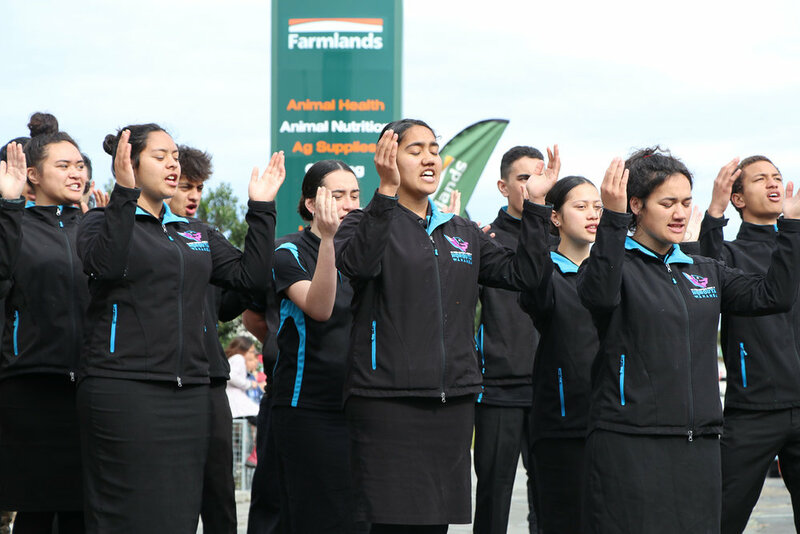 Invercargill welcomes Farmlands’ HeART of the Community project and Mr G.
Paeroa was first. Now Invercargill’s Farmlands store has the second of 15 locally inspired art pieces, created as part of his biggest project to date. At the launch event on Saturday 10th June, excited locals and members of the Munro family got their first glimpse of the massive 7m x 10m mural featuring Burt Munro of “the world’s fastest Indian” fame. The mural theme was chosen by the Farmlands Invercargill team, who wanted to pay tribute to the local legend. According to Invercargill City Mayor Tim Shadbolt, Burt’s portrait is the perfect embodiment of Invercargill’s “pioneering and determined spirit”. The portrait is also situated in prime position along the current circuit of the Burt Munro Challenge. Working from his home in Invercargill, Burt spent 20 years highly modifying his 1920 Indian motorcycle to satisfy his love of speed. He set his first New Zealand speed record in 1938 and went on to set three world speed records at the Bonneville Salt Flats in the USA, one of which still stands. This August will mark the 50-year anniversary of this unbeaten record.